The original building was square timbers hewn byFrancis from trees on his property. The blog below is part of our Early Settlers 2015 Exhibit. Each year we ‘feature’ one of our early settlers in this exhibit space. In putting together this exhibit about Dorset’s first settler we wanted to try and find out more than the basic facts. We went on a hunt for Francis Harvey’s life to find out more. Did he have more than his one child Agnes? Why didn’t his family live here? When did he die? Where was he buried? 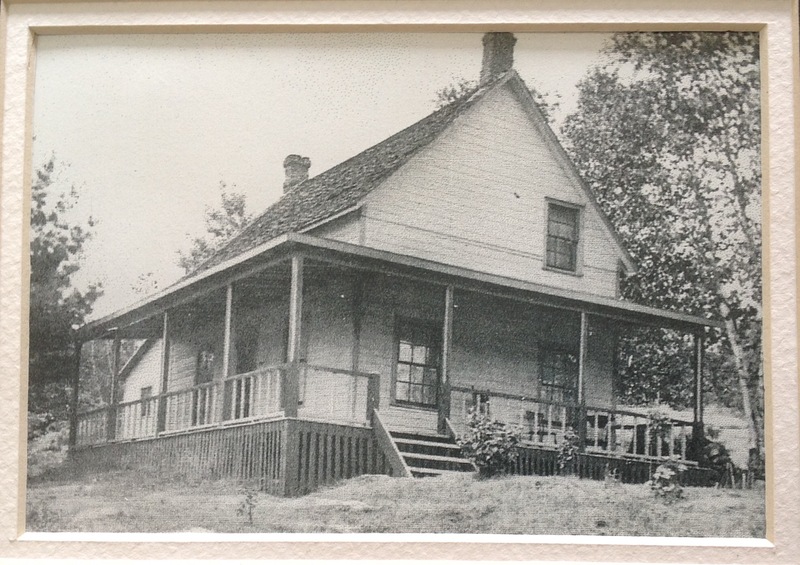 Francis Harvey first arrived here in 1854- 1859, he claimed a very large portion of land that touched both Big and Little Trading Bays, land that ran on both sides of the now Main Street in Ridout Township and in Sherborne Township Lot 29 Con A, and he farmed it with oxen. On this land he built a square timber dove tail home with a second story it sat beside the Anglican Church. Francis built and operated the first trading post sitting where the Dorset Garage is today. Trading with the First Nations people, Francis Harvey ran a small trading post in the Narrows. He traded with the Chippewa. They traded fish, game, brightly coloured utensils, and clothing which had been painted with ochre from Loon Bay on Kawagama Lake. Mr. Harvey also cleared land on Otter Lake at the time it was known as Harvey Lake and the little lake to the east to it Harvey Lake Jr. The name Harvey Lake was later changed by some government worker without local input. He built a square timber dove tail home at the shore. He sold this land to Francis Hoover in 1880 and the building was moved to the top of the hill and added on to and sided over. Francis Harvey donated the land for the United Church, the Anglican Church, and the Methodist Church, and the Orange Hall sometimes referred to as the church hall, beside the Methodist Church. He gave the land for Harvey Avenue. Selling parts of his land later as the village developed and as he grew older. It is believed that the first ones came here through a chain of trails, lakes and rivers on through to Havelock Township down into Hollow Lake (Kawagama), and further down into the Lake of Bays. So quite possibly Francis Harvey came that way too. Francis Harvey was born in Rigaud, Quebec in 1821, his parents were Thomas Harvey who was born in England and Agnes Willman who was born in Ontario. When he ventured here he left behind a farm, and his family in the Prescott Russell area of Ontario, near Hawkesbury which is located near the border of Ontario and Quebec. His parents were alive and farmed near him. Francis Harvey had 8 siblings. Francis Harvey was married to Ellen Smith and they had six children, Agnes, John, Mary Ellen, Robert, Emma Jane, and Annabella Theresa. When Francis came here he had five children. Annabella Theresa was born in 1861. It is possible to think that he came here, he claimed land and then traveled home again for supplies and to see family. Maybe hoping to have them come with him or to come later when he had a home built. He is listed on two 1861 censuses one for our area titled Stanhope, Peterborough, Canada West and East Hawkesbury, Prescott, Canada West where his family were living on their farm. His wife Ellen would have made sure he was listed on the census. On the census for our area it was fun to read that he was listed as a Hunter, and that he lived on Trading Lake! On all other Census records he is listed as a farmer. In 1871 he is listed with his family in Hawkesbury East. We could not find any of his family listed on any 1881 Census records. By the 1891 Census records he is seventy years old living here in Dorset and he is widowed, living on his own as his wife Ellen passed in 1872. By the next Census record of 1901 his eldest child Agnes Harvey McCallum came to live with him and in checking records at the land registry Agnes was in Dorset by 1892. Francis in 1901 was listed as then being eighty years old and his daughter as fifty three. They had had him down as older than he was, his birth date all through the Census records varied slightly except for the 1891 record. Even on his death record they had the term ‘about’ before his birth date! There are local Dorset family remembrances that when he was older he was crippled up his legs didn’t work properly? This did not stop him from crawling from his home across the road to his wood lot to try and work on his firewood. Another known story was that Agnes didn’t want her father to smoke. His friends that stopped in to visit would give him some and this upset Agnes so she discouraged his friends from any more visits. However, the local men feeling sorry for Francis would give some smoking material to their your boys and the boys were allowed to stop in and visit Mr. Harvey! Agnes Harvey McCallum’s name was added to the remaining property that her father owned on September 26, 1894 and she was helping tidy up her father’s affairs. From that document and following documents you can see his handwriting deteriorating to just putting an X for his mark. So you know that his physical health his declining. 1902 Francis Harvey had left Dorset for good. The end of an era here in a Dorset. He would have seen so many changes during his time here! He went back to where the rest of his family were still living, Hawkesbury, Ontario. Living with a family member possibly Robert Harvey his son. On June Twenty-third, in the year Nineteen Hundred and Three, Francis Harvey died. His son Robert Harvey was the informant on the death record and it stated disability as being the cause of death. Francis Harvey was buried in the Barb Protestant Cemetery. The Barb Cemetery is located on County Road 10, in East Hawkesbury Twp., Prescott Co, ON and about 3.5 km East of Hwy 417, and about 0.5 km West of St Paul’s Anglican Church. It is hidden in amongst many trees on the South side of the county road. In closing we can’t help but wonder what his family thought of him being away for most of their lives, if they resented how he lived his life or if they ever understood his need to explore and claim untouched land and be a part of the birth of a new village. We still don’t know if any of them other than Agnes ever came to Dorset even just for a visit. But we do feel that Francis Harvey must have loved his life here. While searching for information on his life we found a few family members doing the same on Ancestry. We thought we may have had some family photos sent to us but they haven’t materialized yet. We remain hopeful. Great history job Kerry filled with important and useful information. I hope this article will bring out more information about Mr. Harvey especially from some of his family. Thank you very much Kerry.